Rebel Legion :: View topic - Berets? Posted: Mon Oct 01, 2012 3:32 am Post subject: Berets? Quite a few RL members do have berets that they sometimes wear with their pilot outfits. They don't work for formal events where accuracy is required, but at other times they're okay. I myself have a red one that I match up with my B-wing pilot from time-to-time. 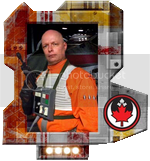 I actually have a picture of me wearing it in my costume profile for my V2 B-wing pilot. The plan was to use the beret as a legion-wide off-duty headgearto help esprit-du-corp.
A 'flash' was produced and sold. Unfortunally, the idea never stuck. I was one of the few who wore beret when not in costume, as far as I know. Honorary member of 1138th Krayt Squadron, Elstree Base (UK). Sometimes coloured berets can be hard to get a hold of. In such cases a simple black (or dark) beret with a gold or silver emblem usually works. I wear a black beret with a gold Alliance insignia when I'm not wearing my bucket. Keeps the glare from my bald head from blinding people. Rennik Fyari - X-Wing Pilot, Chesapeake Suardron, Chesapeake 3 "WildCard"
Mine is black with my Base patch on it. I've worn it out of costume as well.